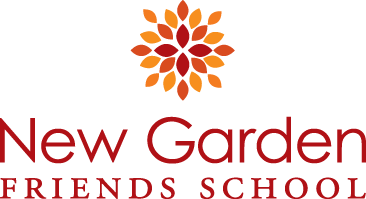 At New Garden Friends School, kindergarten life is about understanding how to be a member of a group that learns together, plays together, and respects one another. Our Sunrise classroom is a supportive environment where children begin to develop academic and social skills within a community of learners, linking family life to school life. Our day includes time for small group instruction and learning centers. Students choose from activities such as art, building, puzzles, and math. Teachers and students explore topics such as plants and birds with a variety of hands-on experiences. Our kindergarten class benefits from a small teacher to student ratio. Your child will receive individualized attention and will have teachers that know him/her as a whole child. Our teachers take the time to create a classroom community that is caring and respectful. Students develop friendships and learn how to solve conflicts. Plenty of opportunities are given for students to engage in cooperative learning in the classroom and in interactive play on the playground. We are a community of learners; individuals are respected for who they are and encouraged to become who they are meant to be. Kindergartners are full of energy, exuberance, and opinions. Our teachers continually listen and model appropriate behavior and language, giving students many ways to express themselves while showing respect for others and for their environment. Safety, kindness, friendship, and listening skills are developed through puppet shows, roleplaying, and discussion. Our classes are interactive, encouraging students to explore, inquire, and stretch intellectually. Research tells us that meeting students at their own developmental level is critical for success in reading, math, and writing. With two teachers and small class sizes, our kindergarteners receive their academic instruction in smaller groups. Our teachers have the opportunity to watch for signals; they know when it is appropriate to encourage a child to delve further and when additional assistance is needed. A predictable, but flexible schedule of teacher directed and student centered activities introduce learning from all disciplines, including writing, math, unit related centers, art, music, Spanish, and PE. Experiential and service learning are hallmarks of an NGFS education, and even our youngest students enjoy numerous field trips and service opportunities. By the end of their kindergarten year, NGFS students will have had reading, math, writing, and problem-solving experiences that are at once motivating and developmentally appropriate. At NGFS, we take learning outside the classroom. Resource classes are part of the daily schedule. Students receive instruction in PE, Spanish, Music, and Art from teachers with expertise in those curriculum areas. In addition to resource classes, service learning is a core component of an NGFS education. A young child’s world is geographically small, so by nature it makes sense for kindergarten students to do service learning projects on campus. Our kindergarten children help those in Greensboro who need a hot meal by preparing a batch of Cowboy Stew that is taken to New Garden Friends Meeting and eventually served at Weaver House. Students learn to manage their belongings and problem solve in a supportive environment. “I need the Peace Bear,” says a kindergartner to the teacher. When she returns,the teacher helps with the words that need to be spoken, “I really didn’t like it when you …” and the child fills in the remainder of the sentence while holding the Peace Bear. Subsequently, the others involved in this problem take their turns with the Peace Bear and come to a resolution for the problem at hand. This simple process of conflict resolution is intentionally taught to our kindergarten students as a way for them to resolve the everyday issues that happen when children work and play together. Teachers provide the support students need as they begin to learn how to problem solve. As time goes by, students get the Peace Bear and initiate conversations on their own.